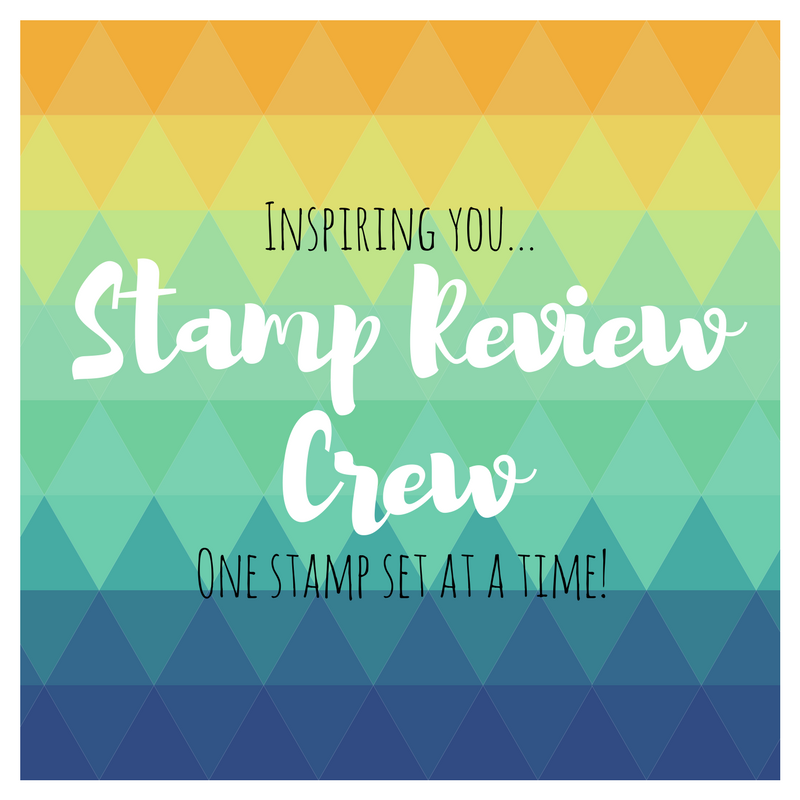 My Sandbox: Stamp Review Crew...Buffalo Check! 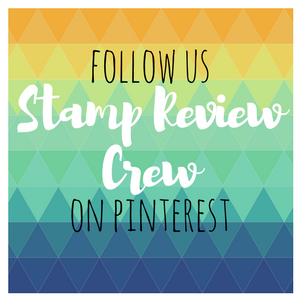 Todays share is the brand new Stamp Review Crews current blog hop showcasing another of my fave new products, the "Buffalo Check" background stamp. 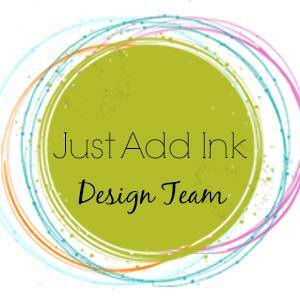 I've always been a purchaser and lover of these stamps, they are so handy for creating your own dsp/background designs in any colour you want or need and being large, means one quick ink up and you're done!....Definitely a must have in crafting supplies! How fab was Mikes project? 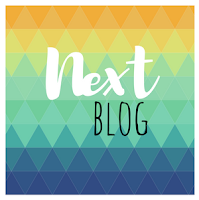 If you are happily hopping, just keep clicking on the "Next" banner below to see all of the amazing work from the design team, or, you can click the SRC link or banner above to start at the begining! For my project this week, l've gone with a "Buffalo Check,Tee-Pee" Christmas project/card in Real Red-Powder Pink-Old Olive & Gold. The images were coloured with Stampin Blends. I think it is really sweet and easily folds flat for posting! Next up on the hop is the amazingly talented Mary Haugen and her no doubt beautiful project! This is adorable! Love the sweet flower! Fun card and a gorgeous color combo! 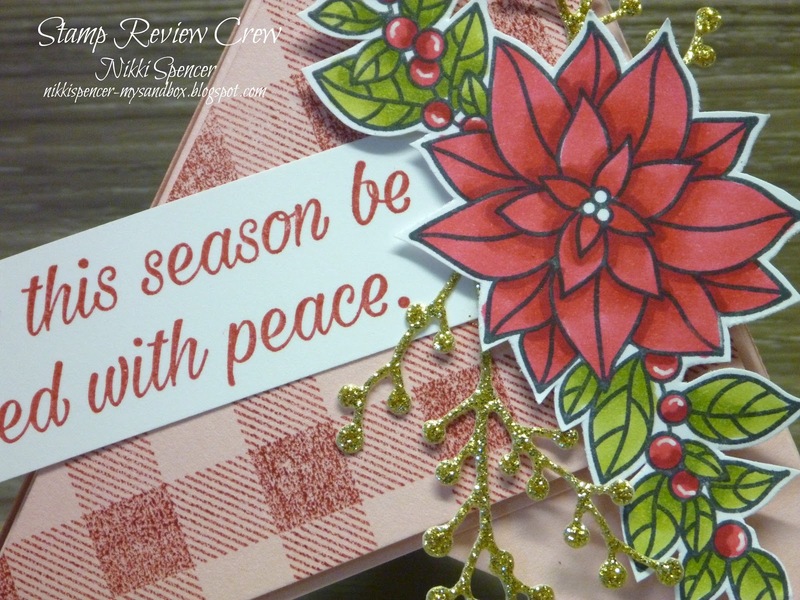 I've never seen this fold and it looks so pretty with all your embellishments! LOVE the red on pink plaid! Such a sweet card! Really beautiful and such a unique card to send friends during the Holidays. Sure to be a keeper! Beautiful card and I love the Tee-Pee. Oh, wow, Nikki! This is so cute and clever. I love the red on pink. Your coloring is superb, and the poinsettia is the perfect accent on this very unusual fold. This is so beautiful! Seeing that check on the diagonal makes me happy! Thanks Bonnie! The found a tutorial on Pinterest and modified the size to suit. It's basically 3 squares the same size (l used 4"x4") scored point to point on the diagonal on each piece. Lay two pieces side by side creating a large triangle with the score lines. Then place the third piece on top ( where the cardstocks join) with the scoreline vertical...l used to tombow glue to attach the overlapping pieces together. The dsp is 3-3/4" x 3-3/4" x 2 pieces cut in half on the diagonal. 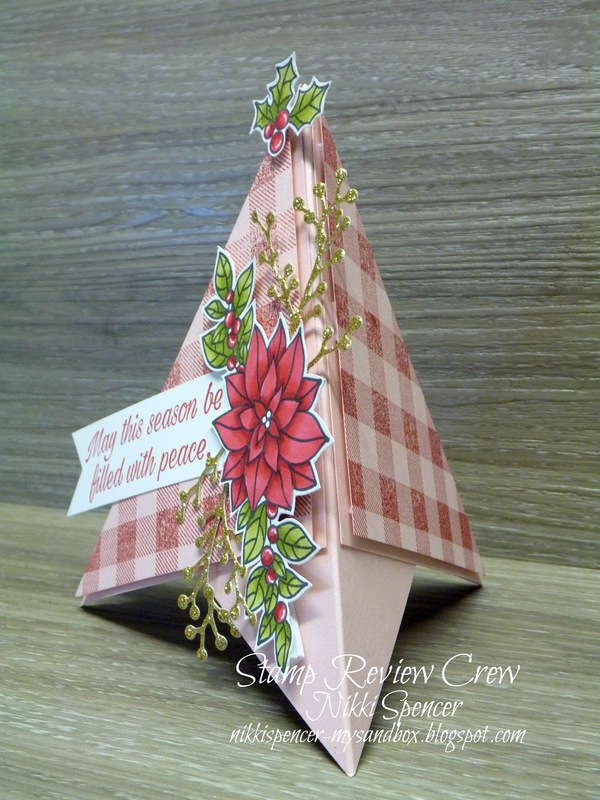 If you search on Pinterest or google for a "teepee" card tutorial it will give you a clearer idea of placement. Where do I learn this Tee Pee fold? Your card is awesome! I wonder if I can color like that when I grow up? Thanks Gloria, I found a tutorial on Pinterest and modified the size to suit. Lay two pieces side by side creating a large triangle in the middle with the score lines. Then place the third piece on top ( where the cardstocks join) with the scoreline vertical...l used tombow glue to attach the overlapping pieces together.